Allergy Advice: Contains Wheat, Egg, Whey, Milk, Soya. Ingredients: Wheat Flour (61%), Sugar, Rice Flour, Palm Oil, Egg Powder, Whey Powder, Milk Powder, Lecithin (Derived From Soya), Ube Flavour (3%), Food Colours (E150a, E102, E127, E133), Salt. 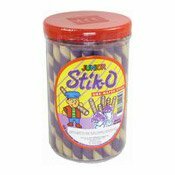 Simply enter your details below and we will send you an e-mail when “Stik-O Ube Wafer Stick (香芋威化條)” is back in stock!